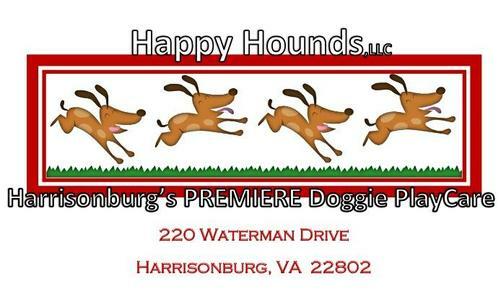 Welcome to the home of Harrisonburg's PREMIERE Doggie Daycare, Happy Hounds! We are committed to providing a safe, affordable play environment for the dogs in our community. Happy Hounds Doggie Daycare is located at 220 Waterman Drive Harrisonburg, Virginia. We make it easy for you to stop in, drop off your dog(s) and make it to work on time! When you return for pick up, your dog will have played all day and be ready to go home and cuddle on the couch! Call Marcie at 540-560-8530 to schedule your dog's evaluation. A half day (morning only) or all day evaluation is required except under exceptional circumstances. We currently have a waiting list so you will need to call for an appointment well in advance. I don't require an evaluation on puppies under five months old, but you still need a Day One appointment so that I can plan to give your pup some extra attention. I can usually find a Day One appointment for puppies within two weeks. Older dogs are usually a month or longer wait. I am sorry about this but it is for everyone's safety! You are also welcome to email us with any questions or to set up your evaluation. For the safety of every dog in our care, it IS required that your dog be vaccinated against distemper/Parvo as well as Rabies and written proof of vaccines must be presented before we can accept your dog to play for the day! We also recommend that you discuss the benefits of the Bordetella vaccine with your veterinarian. For the safety of all of our clients, your dog must also be people and dog friendly. We cannot accept intact males over the age of six months. Sign up for the Happy Hounds email list. Did you know that Happy Hounds occasionally hosts a dog sport called Barn Hunt? To learn more, go to BarnHunt.com. Click here for more details on our next trial Feb. 23-24, 2019. We usually offer some practice and try-it sessions prior to our trials. Follow Happy Ratters of Harrisonburg on Facebook for the latest.